Cellphones could be considered the modern equivalent to a double-edged sword. The pocket-sized computers can navigate across the globe, instantly share experiences and connect us to the greatest wealth of information the world has ever seen. They also distract us from conversations, interrupt our sleep and can create unnecessary anxiety and stress. So how have we as a society adapted to this technology? How has it changed and shaped our everyday life and how can we make sure they don’t negatively impact us? Technology has started to advance at breakneck speeds in the past couple decades. For better or worse these advances disrupt social norms and daily routines. We are just now seeing legislation being introduced on a state-by-state basis that specifically calls out mobile devices to try and prevent distracted driving. Even the United States Supreme Court had a ruling last year that protects the privacy of cellphones from unwarranted searches. No doubt there will be more SCOTUS cases that involve mobile devices in the not too distant future. Having cellphones as a part of our daily lives creates a plethora of new social challenges as well. How should someone conduct him or herself when they have 24/7 access to cat videos? Should you have your phone on the table or in your pocket during a meeting? The Pew Research Center recently released a report that explains survey findings on how Americans view cell phones. Generally, it’s seen as appropriate to be on your phone during passive activities like walking or waiting in line but is frowned upon at restaurants or meetings. Appropriateness aside, is there any benefit to having your phone during a meeting or is it an avoidable distraction? Forbes elaborated on research from the University of Southern California’s Marshall School of Business pertaining to this exact situation. From that research, 86% of survey participants believed that it is inappropriate to answer a phone call during formal meetings and 66% thought it inappropriate for any meeting. With those numbers, chances are good that someone in your meetings doesn’t appreciate it. That means, senior leadership is picking up on it and more than likely, doesn’t appreciate it. Perhaps it would be beneficial to perform an experiment where you leave your phone at your desk for meetings for a week. Keep in mind that having a laptop in meetings can be counter-productive too. According to the Pew Research Center, approximately “64% of American adults own a smartphone”. Let’s assume that a minimum of 50% of American’s actively use their smartphones for email. According to technology market research firm The Radicati Group, Inc., approximately 121 professional emails were sent and received each day in 2014. That means, roughly 5 trillion emails are sent to American cell phones on an annual basis. Cell phones are arguably one of the most useful pieces of technology of our day. For every piece of technology, new challenges arise and it’s up to us as users of the technology to manage those challenges the best we can. Stay tuned in the coming months on how to avoid some of the pitfalls they can create. Deluxe Corporation, long known as a check printer and marketing partner for financial institutions, hired d.trio to promote their newly acquired Deluxe Rewards loyalty solution to several different vertical markets. While Deluxe Rewards is unique (offering customers loyalty benefits to companies without the usual liabilities), the assignment did come with some challenges. To engage a hard-to-reach audience of C-level decision makers, it was essential to not only express the benefits of Deluxe Rewards, but to do so in a fresh way that would build excitement and enthusiasm for the product. 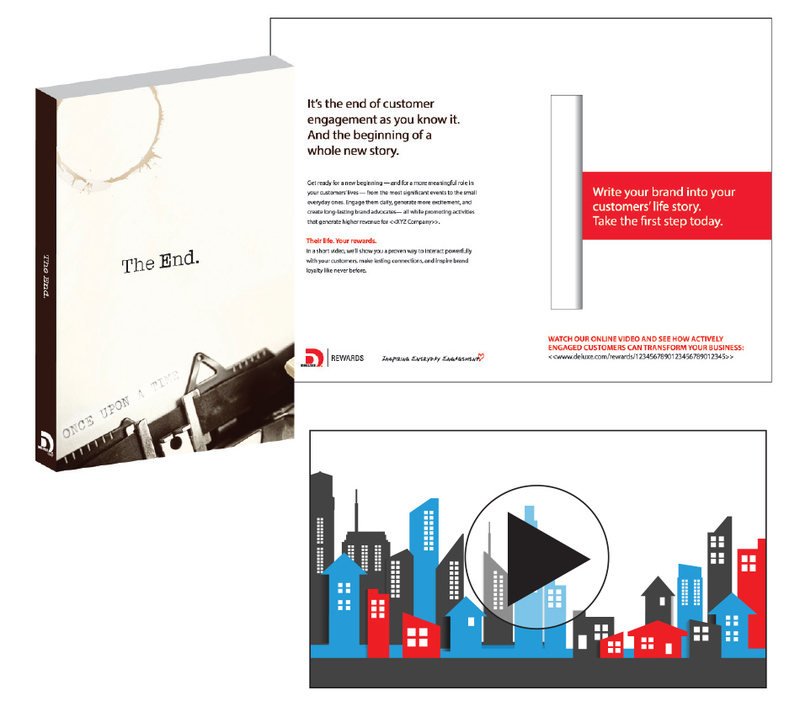 Our strategy leveraged the power of storytelling. To show potential customers how Deluxe Rewards could impact their business, we created a series of journals—one for each vertical market. Built on the theme, Inspiring Everyday Engagement, each journal used sketches, photos, and handwritten entries to tell the story of a fictional consumer. The stories revealed how each person’s rewards program made a positive difference in his or her daily life. In a creative and tangible way, the journals demonstrated the power of Deluxe Rewards to influence buying habits, increase customer loyalty, and change customer behavior. 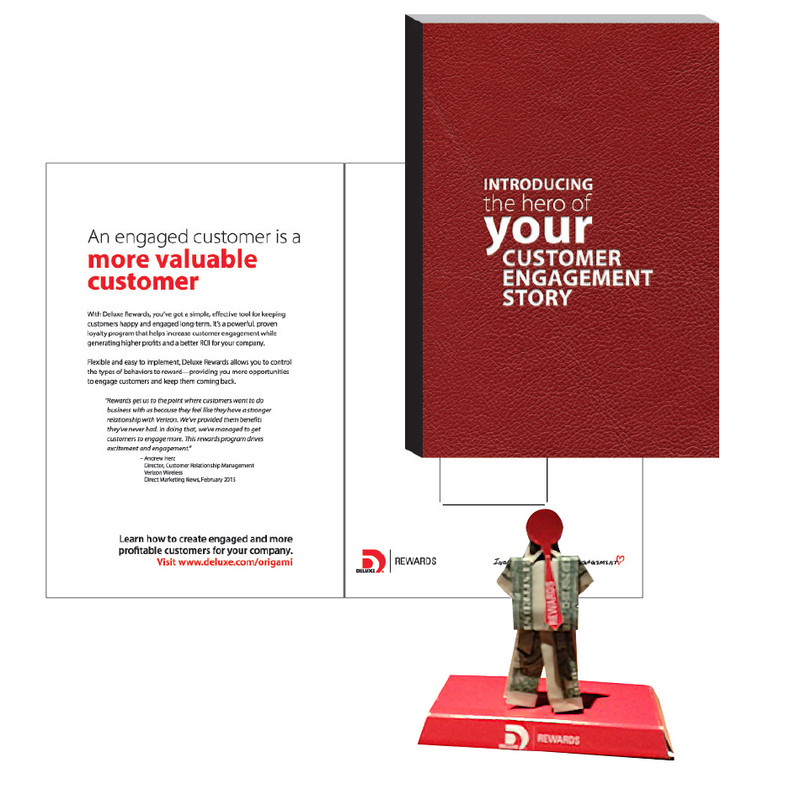 The campaign consisted of three separate 3-dimensional mail drops, each designed to look like a book and highlight a different product benefit. Email follow-ups, unique landing pages, and a video supported the mailings. 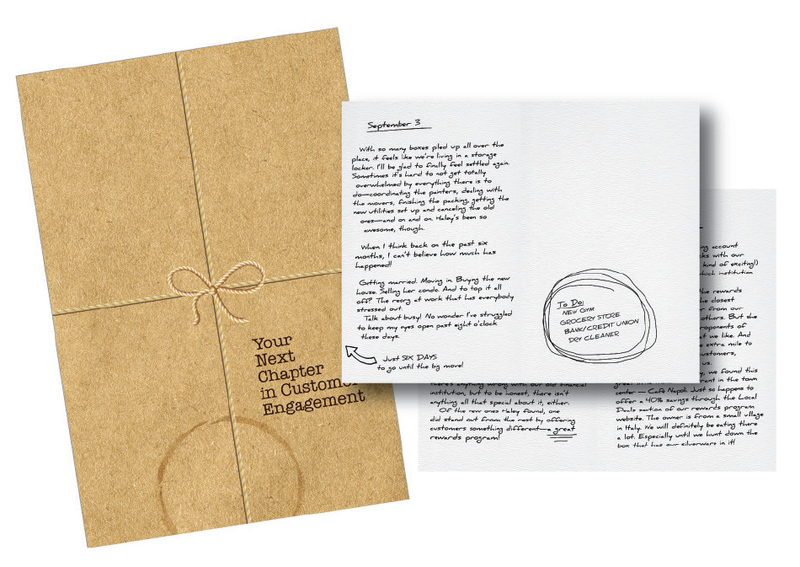 The second package included an industry-specific journal written by a fictional consumer. The handwritten journal showed recipients how Deluxe Rewards could drive their customers’ behaviors as a result of the program. A bookmark was sent as well, printed with the call to action. The final mailing featured an origami “money man” to communicate in a fun way the profitability potential of an engaged consumer in addition to the high ROI from a well-run loyalty program. The package also included a stand so that recipients could display their “money man” as a conversation piece, helping to extend the life of the campaign. When I was kid, the nuns would frequently correct me for my improper use of the word “me”. One would ask “how was your summer?”, to which I would enthusiastically answer “it was great – me and Barb did lots of stuff!”. And she would, of course, reply “you mean Barb and I did lots of stuff”. Sigh, yes, that’s what I meant. It’s my guess that this happened a lot in schools and households across the country. And it’s my belief that these corrections lead us to an overcorrection of sorts. Now it’s not uncommon to hear things like “I’m buying dinner for you and I”. The act of scraping one’s fingernails on a chalkboard never bothered me. But if it did, I would suspect it would feel something like the feeling I get when I hear an improper use of a pronoun. Seriously…how on earth did a good percentage of the population come to say things like “him and I went to the movie”. If you’re reading this and nodding ferociously, you understand where I’m coming from. If you’re reading this and wondering if your pronoun usage is on par, we can help. When you’re dealing with multiple pronouns, just follow this one simple rule and you’ll be golden: Separate the Subjects. “I’m buying dinner for you and I” becomes “I’m buying dinner for you” and “I’m buying dinner for I”. Anyone with English as a first language knows that “I’m buying dinner for me” is the way to go here. “him and I went to the movie” becomes “him went to the movie” (arghhhhhhhhhh!) and “I went to the movie”. Need I say more? We hope this little rule will help you the next time you’re in a conundrum over which pronoun to use. We promise it will make you sound a whole lot smarter. And who doesn’t want to sound smarter? Me sure do. Ok, this is not about putting an end to office meetings, much as we all would like to see that happen. This is more about how to help your meetings end more successfully. By paying more attention to how meetings typically end, I’ve come to believe that creating a good ending to a meeting is one of the more important but often overlooked meeting practices. Seldom does a meeting end badly, but all too often, meetings seem to dissipate, drift or fade out, rather than end. As the finish time nears, energy drops as attendees start looking at their phones, thinking about what they need to catch up on, or their head is already onto the next meeting. A deliberate good ending can greatly enhance the time just spent for all present. If possible, the person conducting the meeting should do what they can to raise energy at the end of a meeting with just a word or two of positive reinforcement. I believe that when a meeting ends well the attendees think about the subject matter just a little bit more. I’ve also noticed that the ideas that manifest after a meeting are usually equally or more important than the thinking that occurs during. In short, good endings create better results. Every August at the end of the month, thousands flock to indulge not in our 10,000 lakes, but Minnesota’s 10,000 ways to fry food. Ranked as one of the country’s best State Fairs, each year Minnesotans and fair goers await the anticipated list of “new fair foods.” This year did not disappoint. From deep fried ribs, to mac & cheese fried cupcakes, and even whiskey-spiked hand-held pies, the new food list never ceases to intrigue. While Texas holds the title of the country’s largest state fair, Minnesota comes in at a close second. Part of the reason for its popularity is the fair’s largest free exhibit: the CHS Miracle of Birth Center, where fairgoers watch the birthing and first steps of baby calves, lambs, goats and piglets. But the Minnesota state fair goes beyond the exceptional livestock. Competitions include rulings on Christmas trees, bees and honey, flowers and much more. Attendees also seek out the famous butter sculpture, designed to resemble the year’s Princess Kay of the Milky Way, a woman crowned every year as the official ambassador of the Minnesota Dairy Industry. The Minnesota State Fair also touts live, headlining performances, and again, the food. Of course this is all familiar to us because d.trio hails from Minnesota. But it got me wondering: what are other fairs known for, and most importantly, what should we eat? Below is a list of this year’s new food at the Minnesota State Fair, and other fairs worth the travel time! Iowa State Fair: known for its standout food with nearly 200 concession stands and 50 different treats on a stick. Standout food item: Octodog – a hot dog shaped like an octopus, also fried butter, because why wouldn’t we. Alaska State Fair: Known for its monstrous produce competition. Previous winners have included a 20-pound carrot and a 1,000-pound pumpkin. New York State Fair: Known for it’s wine “tent.” Wineries across the state host tastings and compete for top-vintner status. Sign us up! Texas State Fair: Known for its size. Boasting the largest fair in the country, the Texas fair has 76 thrill rides, a 1,800-foot-long aerial skyway gondola and the tallest Ferris wheel in North America.